Gianyar is a regency in Bali Province of the Republic of Indonesia, Gianyar regency is also known as the art center on the island of Bali. 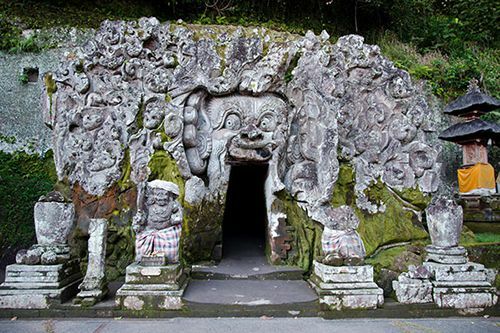 Apart from that, Gianyar Regency also has many interesting tourist attractions to visit for those who are on holiday in Bali island. 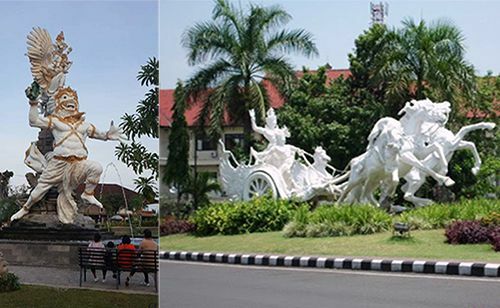 Gianyar regency is located approximately 33.2 km or 1 hour from Denpasar city. Based on archaeological evidences in Gianyar can now give way and knowledge for us to know about the past in Gianyar about 2000 years ago with the discovery of archaeological sites and tools (artifacts) such as stones, metals, Nekara bronze (single-cast bronze kettle drum) which is known as The moon of Pejeng (Indonesian: Bulan Pejeng), reliefs depicting human life, and the temples as well as the caves that are found in the cliffs of the Pakerisan river (Tukad Pakerisan) Gianyar, Bali. After the discovery of written evidence in the form of inscriptions on stone or metal, it can be identified the site of the central area of ​​the kingdom of Warmadewa dynasty in Singamandawa palace, Bedahulu, Gianyar Bali. King Adipati Ida Dalem Kresna Kepakisan (1350-1380 AD), as the forerunner of Kresna Kepakisan Dynasty, then Keraton Samprangan able to survive for more or less three centuries. Two of the last king of Bali, Ida Dalem Sagening and Ida Dalem Dimade has spawned the forerunner to the authorities in some regions. Ida Dewa Manggis Kuning (1600's) rulers in the village of Beng, Gianyar is the forerunner of Manggis Dynasty that emerged after the second generation to build the kingdom of Payangan, Gianyar (1735-1843). A son of the King of Klungkung (Ida Dewa Agung Jambe) named Ida Dewa Agung Anom emerged as a forerunner to the dynasty of kings in Sukawati, Gianyar (1711-1771 AD), including Peliatan and Ubud, Gianyar Bali. In the same period, the period of the Kingdom of Gelgel, there are also other local authorities, namely I Gusti Ngurah Jelantik ruling in the region of Blahbatuh, Gianyar and then I Gusti Agung Maruti ruling the region of Keramas, Gianyar, both are descendants of Arya Kepakisan. More than a quarter century ago, precisely in 1770 AD, approximately 2 km in the southern side of the village of Bengkel (now known as Beng village) built a new palace called Grya Anyar. The Griya Anyar palace establishment or who later became Puri Agung Gianyar, which was inaugurated with a ceremony on 19 April 1771, has signaled the birth of a new kingdom, which is ruled by Ida Anak Agung I Dewa Manggis Api or also called I Dewa Manggis Sakti. After being crowned as king, he holds the title I Dewa Manggis IV, as the first king of the Kingdom of Gianyar (Gianyar King I). The Puri Agung Gianyar as the king's palace then became the center of the capital of the kingdom. After I Dewa Manggis Sakti passed away as the founder of the kingdom of Gianyar that is fully sovereign, and then the heir of the throne passed to the crown prince (Ida I Dewa Manggis Di Madia) who holds the title I Dewa Manggis V as the King of Gianyar II. Dewa Manggis V reigned in 1814-1839 AD. After he died, then replaced by the crown prince (Ida I Dewa Manggis Di Rangki) who holds the title I Dewa Manggis VI as the King of Gianyar III, who ruled from 1839 to 1847 AD. The next heir to the throne as king of Gianyar is Ida I Dewa Manggis Mantuk Di Satria (I Dewa Manggis VII). He reigned as king of Gianyar IV long enough for 38 years from 1847 to 1885 AD, before being deceived and taken prisoner by Ida I Dewa Agung (King of Klungkung). After Ida I Dewa Manggis VII was exiled in 1885, the throne in the palace of Gianyar been paralyzed until his death in 1892 AD in exile in Satria, Klungkung. Then the territory of the Royal Kingdom of Gianyar controlled by Bangli and Klungkung empire. 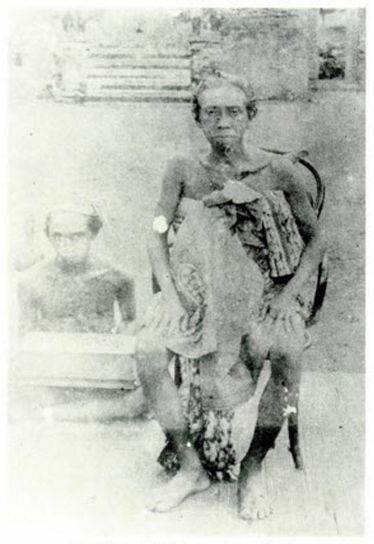 In January 1893, two sons of Ida I Dewa Manggis Mantuk Di Satria named Ida I Dewa Pahang and Ida I Dewa Gde Raka and together with their family managed to escape from exile and return to Gianyar. Ida I Dewa Pahang as King Gianyar V had successfully managed to escape from detention of the troops of the Klungkung and the Bangli Kingdom. For three years (1893-1896) he struggled and managed to free the Gianyar Empire from the clutches and the rule of other kingdoms, so Gianyar kingdom has succeeded in taking back its sovereignty. After Ida I Dewa Pahang died, then the throne followed by his younger brother named Ida I Dewa Gde Raka. He was crowned as King of Gianyar VI and ruled from 1896-1912. Hostility and conflict endlessly with the kingdoms of Badung, Mengwi, Bangli and Klungkung led to a situation of life in the kingdom of Gianyar be chaotic. Highlight the suffering of its people and to seek protection in order to save the kingdom from collapse because it was threatened and assaulted by four neighboring kingdoms from various directions, then Ida I Dewa Gde Raka finally handed over sovereignty of the kingdom of Gianyar to the power of the Dutch East Indies. Furthermore, Ida I Dewa Gde Raka (Ida I Dewa Manggis VIII), King of Gianyar VI, as stedehouder of Dutch East Indies government in Gianyar. Then on May 23, 1912, he resigned voluntarily. By the Decree of the Governor-General, dated January 11, 1913, Ida I Dewa Gde Raka dismissed with respect as stedehouder in the Kingdom of Gianyar Bali. Ida I Dewa Ngurah Agung who is the son of Ida I Dewa Manggis VIII later succeeded his father in the kingdom of Gianyar and appointed as Regent for the Heads of Government in Gianyar and given the title "Anak Agoeng". Furthermore, since July 1, 1938, the areas in Bali designated as autonomous regions (Swapraja), each headed by Zelfbestuurders. Ida Anak Agung Ngurah Agung as a King (zelfbestuurders) Gianyar, together with the kings of other autonomous regions in Bali inducted with honors in Besakih temple on June 29, 1938. During the Japanese occupation in Gianyar which started on February 23, 1942, the kingdom is still led by King Gianyar, Ida Anak Agung Ngurah Agung. Then on August 23, 1943, his son who was named Ida Anak Agung Gede Agung was sworn in as king (Syutjo) Gianyar succeeded his father and ruled until the end of the Japanese population in 1945. Entering the independence and periods of residence allied soldiers and NICA (Netherlands-Indies Civil Administration), Gianyar kingdom under the leadership of King Ida Anak Agung Gede Agung remains as an autonomous region/part of the government of Bali. Bali itself becomes part of the administration of the State of East Indonesia (Negara Indonesia Timur (NIT) ), while the NIT is a part of the Republic of Indonesia States (Republik Indonesia Serikat (RIS) ). With the formation of the Unitary Republic of Indonesia (Negara Kesatuan Republik Indonesia (NKRI) ) on August 17, 1950, the government made changes to the system. The former territory of the kingdom in Bali, amounting to 8 kingdoms serve as regional parts/autonomous regions. The autonomous regional government composed of the Chairman of the Board of Local Government and the Regional House of Representatives (which has full parliamentary rights). The Regional Representatives Council who have been inducted, then in charge of selecting the Chairman of the Board of the autonomous regional government of Gianyar, and then Ida Anak Agung Gde Oka is selected for the period 1953-1958. After the issuance of Regulations No. 69 of 1958 about the establishment of the Autonomous Region Level II, where the executive power is run by a Head of the Autonomous Region (Swatantra), and then Ida Anak Agung Gde Oka re-elected as the Head of Regional Level II of Gianyar with the service period 1958-1960. Following the issuance of Presidential Decree of July 5, 1959, then set out with determination No.6 / 1959 that the local government is composed of Regional Leader and Regional Representatives Council. The regional leader is a State official as representatives of the Central Government in the region (Regent, Indonesian: Bupati). During the implementation of the Presidential Edict No. 6/1959 in Gianyar (period 1960-1969) have been recorded four times in the succession of the Head of the Autonomous Region Level II and which is also called the Regent (Bupati). The period of service 1960-1963, the Head of Autonomous District Level II of Gianyar held by Tjokorda Ngurah, replacing Ida Anak Agung Gde Oka. Furthermore, the service period 1963-1964 led by Drh. Tjokorda Anom Pudak as the regent of Gianyar. The next period of 1964-1965 held by I Made Suyoga. BA as a Regent of Gianyar with service period 1965-1969. Entering the New Order government period, issued Law No.18/1965, then the Autonomous Region Level II of Gianyar designation was changed to Gianyar regency as the Regional Level II. The Head of the region is a Regent. The Law No.18/1965 and then refined by Law No.5/1974 about the Principles of Regional Government. History of Gianyar City defined by the Regional Regulation of Gianyar regency No. 9 the year 2004 on April 2, 2004, about the anniversary of Gianyar city. The official regional seal (symbol) of Gianyar Regency Bali, in accordance with the regional regulation about the regional symbol of Gianyar Regency No.21/PD/DPRD/1972 on August 10, 1972. Gianyar regency is one of nine regencies in the Province of Bali. Gianyar regency is geographically located at coordinates of 8.4248° S and 115.2601° E.
Gianyar regency has an area of ​​368 km2 or 36,800 ha (6.53% of the total area of ​​the island of Bali). 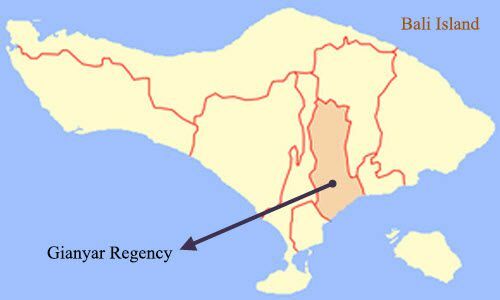 Gianyar Regency area lies from North to South. Average land conditions are not so high above sea level. The Southern part of the Gianyar Regency is 30% of the land, while the northern region is an area of ​​undulating. The land that reaches a height of 750 meters above sea level is not so wide, that is only 2,463.5 ha compared to the total land area. In the southern part are a flat area and a rather low because it is close to the sea. In the southern part, lies the black sandy beaches along the more or less 20 Km. Gianyar regency does not have lake or mountain. Rock formations in Gianyar regency consist of quaternary formations derived from lava and sludge Lava of Buyan, Bratan, and Batur. Deposition of the lava was thick enough so that the rivers in this area have the valleys with narrow streams and deep, especially in the area of ​​the corrugated region in the northern part of Gianyar regency. The river flows from the mountains in the north to the south towards the sea. These rivers are mostly permanent and drain the water throughout the year. Melangit river is the boundaries of the Gianyar regency with Klungkung regency. The climate of Gianyar regency is tropical maritime climate, the same as the other districts in Bali. Having two seasons, dry season (April to October), and the rainy season (October to April). Temperatures in Gianyar regency, the average is 26° Celsius, with the lowest air temperature of about 23° Celsius and the highest 29° Celsius, with an average humidity 82%. Population in Gianyar Bali in 2008 was 438,974 inhabitants with a population density of 1,193 people/km2.